Pick the two most popular cuisines of the moment (Japanese and Italian, in case you’re wondering), serve them side by side, and the people will come. At least that seems to be the mentality behind L’Hotel élan’s signature restaurant. As the new kid on the Kwun Tong block, Forte undoubtedly brings something fresh to the cha chaan teng-dominated area. The restaurant makes a good first impression, especially since the industrial-inspired décor exudes casual chic without reaching for a stuffy, fine dining ambiance. The excellent bread basket also breeds high expectations. The house-baked grissini is particularly delicious, arriving at the table still warm and chewy with crispness around the edges. Even better are the dense loaves baked with pungent blue cheese clinging to one face. But things get confusing from there: the menu (presented on an iPad) is diverse – sporadic even – with fresh sushi platters sharing screen time with homespun pastas. That’s not all: scroll down to the bottom of the menu and you’ll find Chinese stir-fried beef noodles and Hainan chicken rice. It’s difficult to plan your courses, which is why most people turn to the staff. Unfortunately, they don’t seem to be well-versed in the menu either. Our first recommendation – the Basilicata seafood soup ($88) is a major disappointment, not to mention nowhere near the glamourous presentation or portion size displayed in the iPad menu. There’s one scallop, mussel and a single prawn floating dismally in a bland broth studded with bits of tomato. It’s a disheartening starter, and we wonder if we should have gone for a platter of fresh oysters or seasonal sashimi from the raw bar instead. We’re also surprised when the staff advises us to choose the risotto over one of the handmade pastas. 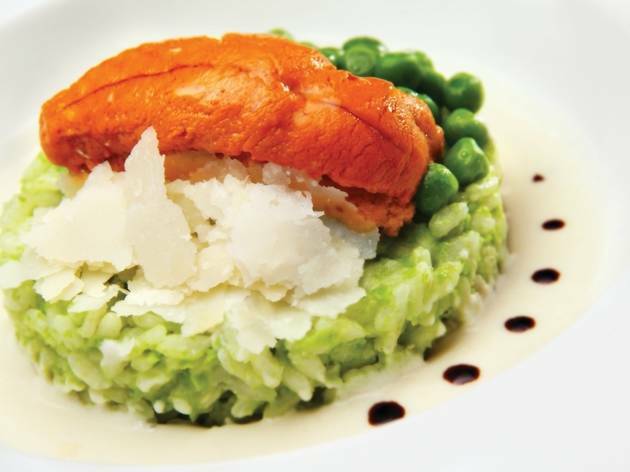 To be fair, the risotto is not bad – a bed of al dente Arborio rice topped with green peas and a sliver of Canadian sea urchin ($188). The parmesan sauce is the star – fragrant and savoury without being overpowering. An ingenious touch of balsamic vinegar perks up the whole affair. We’d be happy with this dish even without the uni. The pan-fried Mediterranean sea bass ($298) and grilled beef tenderloin ($298) are also executed well, slightly redeeming the tasteless soup at the beginning of the meal. 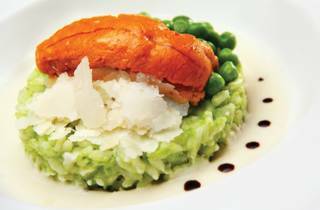 The former has milky, almost cod-like flesh that twins well with the creamy beurre blanc sauce. As for the tenderloin, the cut boasts a strong, meaty flavour and an aromatic char. Given the varied international repertoire in the menu, the strictly Western desserts section is somewhat unexpected. But there are discrepancies here too: the apple tart ($88) arrives as two measly strips of phyllo pastry blanketed in the thinnest slices of Granny Smith apple. The banana tart ($88), on the other hand, fares much, much better. Again, the base is phyllo, but this time, it’s overspilling with ripe bananas and drizzled with caramel. Add a spoonful of toasted sabayon on the side and this is a pretty sweet deal. 2/F, L’hotel élan, 38 Chong Yip St, Kwun Tong, 3968 8666. Daily 6.30am-midnight.